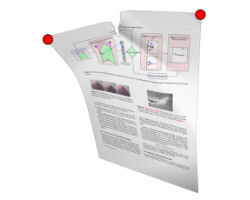 Abstract : We propose an efficient method to model paper tearing in the context of interactive modeling. The method uses geometrical information to automatically detect potential starting points of tears. We further introduce a new hybrid geometrical and physical-based method to compute the trajectory of tears while procedurally synthesizing high resolution details of the tearing path using a texture based approach. The results obtained are compared with real paper and with previous studies on the expected geometric paths of paper that tears.